It was a crazy series. Minnesota played well, but the Blues just kept them out of the slot enough that even though the Wild had the puck most of the time, they never got many old chances. And Jake Allen was ridiculous. It might be too much too hope that they can ride him for another 12 wins. I thought getting Stastny back actually helped them offensively today. I think they can have a better series against Nashville, which, by the way they smoked Chicago, the Blues will need every goal they can muster. What a bad person P.K. Subban is, distracting the Habs while they exit the first round. What a garbage series by Montreal. Bergevin needs to be driven out of town post-haste. Everyone saying "Weber was good, PK wouldn't have changed the outcome" is missing the point - Montreal took on terrible contract to win and improve now. This first round exit just means that Weber gets one year older and Price is one year away from deciding he's had enough of Montreal and signing elsewhere. Meanwhile an injured Subban, the supposed defensive liabiliy, was a defensive stalwart, shutting down Toews and Kane in a 4 game sweep. Time to go full Toronto and tank hard. Fire Bergevin and resetart, and build a team based on aptitude, not so-called "character. I pretty much agree Dysplastic. Marc Bergevin inherited a golden generation of players in Pacioretty, Subban, and Price plus the 3rd overall pick and a pretty good prospect group. He wasted years of that generation on Michel Therrien and did basically nothing to improve the team until he traded for Petry. I guess it shouldn't be surprising that a GM is out of his depth when he comes into the job with at most 3 years of relevant experience and a high school education out of Major Junior. I think the team needs to rebuild and I think they could do with some tanking but in a smart way. I'd hopefully dump Weber's contract while he still is well regarded around the league, hopefully dump Shaw, and then trade Price and Pacioretty for futures because their contracts are winding down. You still have Beaulieu, Gallagher, and Galchenyuk to hopefully be a part of your next core. Hopefully Beaulieu and Galchenyuk given time and patience will become the players they had promise to be (Galchenyuk's scoring rates in particular has always been good, he just never gets the icetime. Then you build your team as if you're trying to actually build something, add good players at reasonable price whenever you can. But in goal you bring in the worst goaltenders you can get away with without the league coming in and intervening like the NBA did with Sam Hinkie. Guys in their late 30s who are washed up, bad AHL goalies, Ondrej Pavelec.Once you've had a couple of top picks who are ready to make the jump you go out and get decent goaltending. On the PDOcast Tyler Dellow mentioned the Maple Leafs tanked more or less by getting killed by percentages while the Sabres did it by ruining their defense and team. That makes sense to me, so kill it with bad goaltending. Next year they'll still be the same Wild, with no one able to finish. Parise is the only one you can count on when it matters and he's been getting beaten up, injured, and is aging and will not be able to play up to his contract soon. I expect a bleak period to come while we pay for the Suter and Parise contracts, not to mention losing someone pretty good to Las Vegas. Seems like everyone is predicting that'll be Zucker, but surely we'll have to expose a decent defenseman as well. Frankly I'm not sure I care who we lose as Reilly and Olofsson can hopefully replace any D lost and while Zucker would be annoying because he's the closest thing to an individual offensive threat this team has I'm not sure he'd be that big a loss. Regardless, I foresee several more years of 1st and maybe someday a 2nd round exit thanks to just enough talent in the pipeline to keep us from dropping out of the playoffs. I do feel they didn't get what they deserved this series, but I'm not so sure that that isn't simply who they are and they'll never see the results of their hard work and good play unless someone finds the ability to put a puck in the net. They were fun to watch pretty much all year though other than the one miserable period in March, and there's enough talent coming to keep me semi-hopeful. Just not enough to overcome my proper levels of Minnesota sports pessimism. not to bud in on the Habs pitty parade and try and be reasonable but Price is 29. Isn't it a bit premature to be talking about exploding the team? Exploding Bergevin yea. Unless theres a stat that goalies start to fall off a cliff in their 30's. ladies and gentlemen... Clarke MacArthur !! Washington looked like the better team tonight, but not by a huge amount, and I'd say deserved the win. Anderson was outstanding for Toronto. That Leafs team is going to be pretty great if they can keep Lamoriello from accumulating grinders. His contract's up at the end of next season. He does probably have at least another 6 years of good+ starter left in him. But, if you're going to blow it up I don't think he'd want to stick around for a rebuild and like I said, it's a lot easier to tank and then fix the tank with a horrible goalie than a horrible roster. (Zach Fucale come on down). It's all moot though. Bergevin's 5-year extension kicks in this summer. Bergevin sticking around means Weber's not getting moved and until that contracts off the books through reputation trade or retirement the team can't aspire for anything more than getting into the playoffs. They'll re-up Price at a huge number and hope that goaltending will carry them but it won't carry them anywhere significant. I just have zero faith at this point that building a team from the net out is the path to an actual championship. Price can steal a series, maybe two, but doing it for four straight playoff rounds? He'd have to be like Roy in 86', and I don't think anyone has that magic anymore. The rest of the team seems too broken to fundamentally fix with tweaks and free agent additions, and keeping Price around ensures that the team is always competitive enough to make the playoffs and get late round draft choices, but never competitive enough to actually win, because they never get the superstars on offense that seem necessary these days to do so. If they land Kovalchuck from Russia....maybe a different story. Still, center depth is the real issue and he doesn't solve that either. The next step is always tough. There are a lot of ways to go wrong building an organization, but as a Leafs fan I have to be very happy with the outlook of the team. Washington was the better team in the series, agreed, but we pushed them hard. Next year we'll be better. The Leafs have holes (a top 4 D is on the top of the list) but the bones are good, and Matthews, Marner and Nylander are stars. Babcock is an excellent coach, though seeing him every game you start to see the flaws. Anderson is a clear number one goaltender, capable of stealing games (although I'd love a good backup so he doesn't have to play 70 games). Anyway. Round 2 starts shortly - I think I'll start pulling for the Caps, given that we had such a good series with them. This P.K. Subban guy is pretty good for a #3/4 defenseman. So....is goaltender interference a thing anymore? I'm trying to adopt the *Legion* approach and radically accept that bad calls happen, are just part of sports, and we should just deal with it and move on...but it's tough. After spending most of the year telling myself to not care about hockey because the emotional lows are way more annoying than the emotional highs are gratifying, I'm falling into the same traps this year with Edmonton. At least with Montreal there was a bit of Schadenfraude in seeing the team lose (and I'm still cheering on PK), but with Edmonton the calls are just...ugh. ya that was rough. if I was an Oilers fan I would be livid. at least the Sens played so badly in the last two game that I couldn't really blame the losses on the bad officiating(even though it was terrible). hopefully they bring some life this afternoon and show that they belong in the second round. Good series, Gumbie. 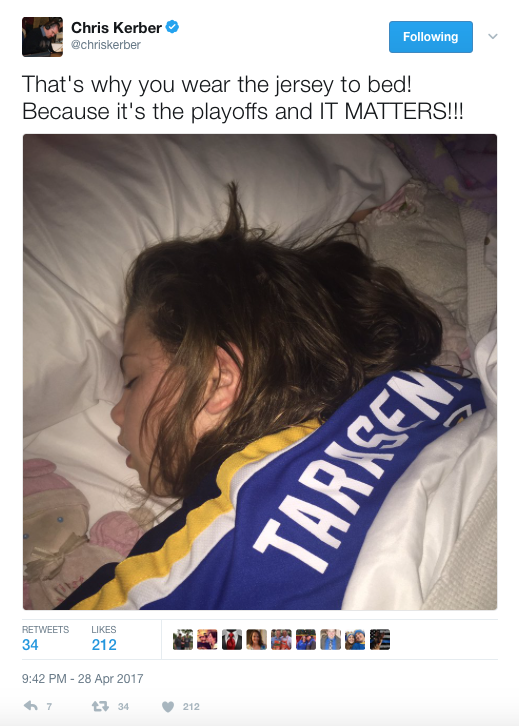 At least the Blues competed. I think both teams played tough as hell. The Preds just had a bit more firepower, due mostly to those defensemen. Sens? really didnt expect to win in NY. Just really enjoy the result so far vs the expectations going into the season. Handing out allot of f*ck you see to people who didn't even think the Sens would make the playoffs. Its not a team filled with all star type names but the average talent level is pretty decent and allot of good stories to go around. I'm glad that it was a more convincing win and not another come-from-behind-in-the-last-minute-and-win-it-in-overtime. good to show we can actually play with a lead and hold it. Handing out allot of f*ck you see to people who didn't even think the Sens would make the playoffs. at least half of my joy is from being able to rub it in the face of all the analysts, reporters and bloggers that never took us seriously. I'm sincerely congratulating all the Sens fans around work today. No animosity from this Habs fan* towards a franchise that can set a good example of how to do things properly, especially given their budget. And hey, look, Guy Boucher is a good coach! An Oilers-Sens final would be amazing. P.K. Subban fined for "embellishment" for getting getting clocked in the head and heading to the dressing room to see if he needed treatment. 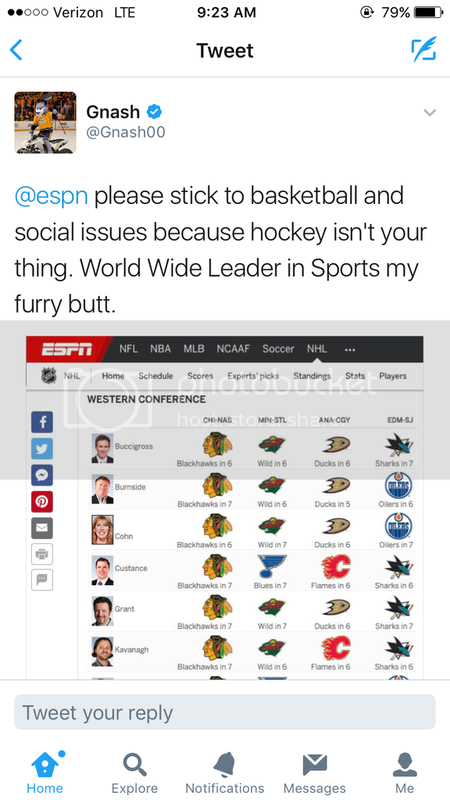 The sport would be so much better if the NHL collapsed. My dream of an Edmonton-Ottawa cup finals is dashed. Still a chance of that Nashville-Ottawa series to freak out the ratings suits at the NHL. Subban v Karl for best D + maxium Canadiens pain. after a few days of every single sports media and blogger whining about Ottawa's "boring" style, it felt really good to torch the Penguins 5-1 last night.